We are currently cooking for about 19 clients and are always open to more coming on board. This past financial year we welcomed a new cook and new volunteers. We encourage the residents of Rainbow Beach to give us a call if they require any assistance with meals. You do not need a referral to be able to get meals, anyone is eligible. Call Michelle on 0427 701 922 to find out how Meals on Wheels can help. Last month, we recognised Beryl Murray and Dawn Gant who have volunteered with Meals on Wheels for the past 27 years. 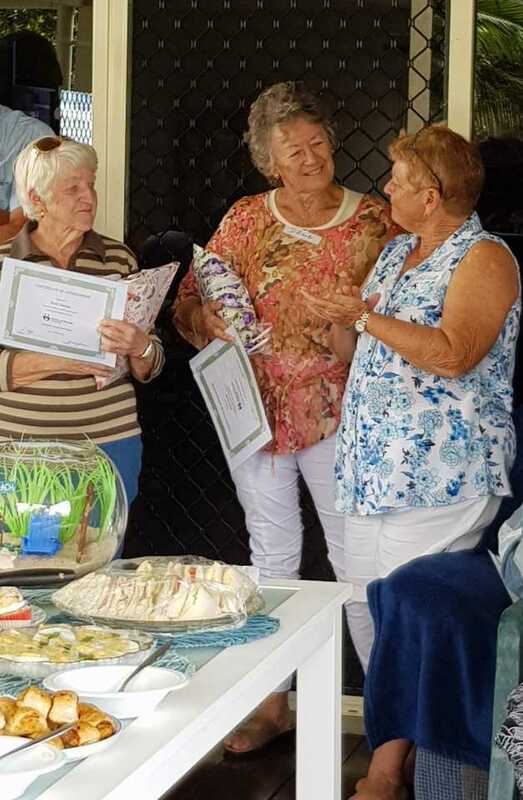 We celebrated National Volunteers Week by hosting a lovely morning tea and offered a special presentation to thank Beryl and Dawn – thank you ladies for such a wonderful effort!. In June, we also ran a very successful sausage sizzle at the Tin Can Bay markets. Thank you to all the locals who came out and supported us and thank you to the volunteers who helped on the morning..A special thank you must go to the RSL for allowing us a site at the markets. Finally, we were very lucky to receive a grant from Gympie Regional Council, enabling us to purchase a new computer for our treasurer, making her life so much easier! Thank you Gympie Regional Council. So what about the Beach Stairs? A Fun Run on the Beach!